Technically there are internal and external product audits. External audits are not normally described as audits, but they can be called audits. Especially in service companies. 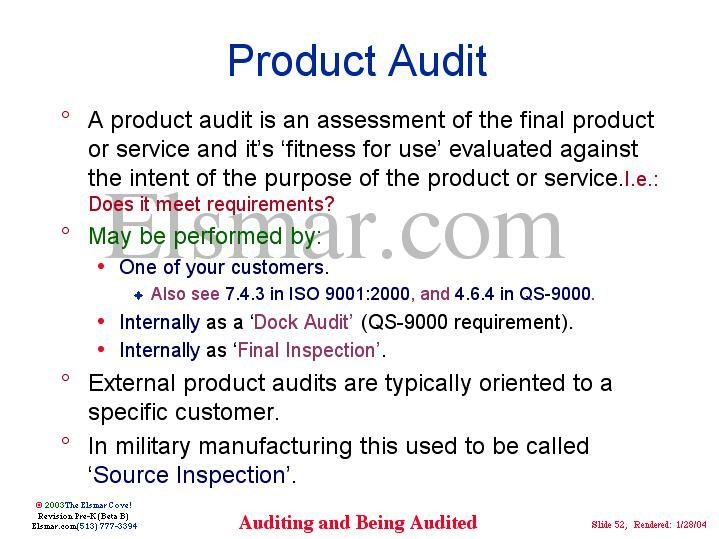 A product audit is an assessment of the final product or service and it s fitness for use evaluated against the intent of the purpose of the product or service. I.e. : Does it meet requirements? Also see 7.4.3 in ISO 9001:2000, and 4.6.4 in QS-9000 (now IATF 16949) . Internally as a Dock Audit (QS-9000 (now IATF 16949) requirement). Internally as Final Inspection . External product audits are typically oriented to a specific customer. In military manufacturing this used to be called Source Inspection .